Polished by KPT is one of my go-to brands for unique, high-quality thermals. Calypso, part of the brand’s special 3rd anniversary trio, is no exception. There’s a great contrast between the fuschia pink of the “warm” color and the deep plum of the “cold” color, and the polish is jam-packed with other elements that make it stand it from the crowd (like pink shimmer and holo microglitter). The transition is speedy and impressive, even in the absurdly hot summer weather. I really love the depth and sparkle of this. The different size holo microglitter and the pink shimmer amp this up to another level. Sure, you can find a pink-purple transition in almost any thermal brand/line. But you’re not going to find another one like this. It just has so much going on, in exactly the right way. It looks killer in all lights and is sparkling back to the cheap seats. High impact for your money’s worth. 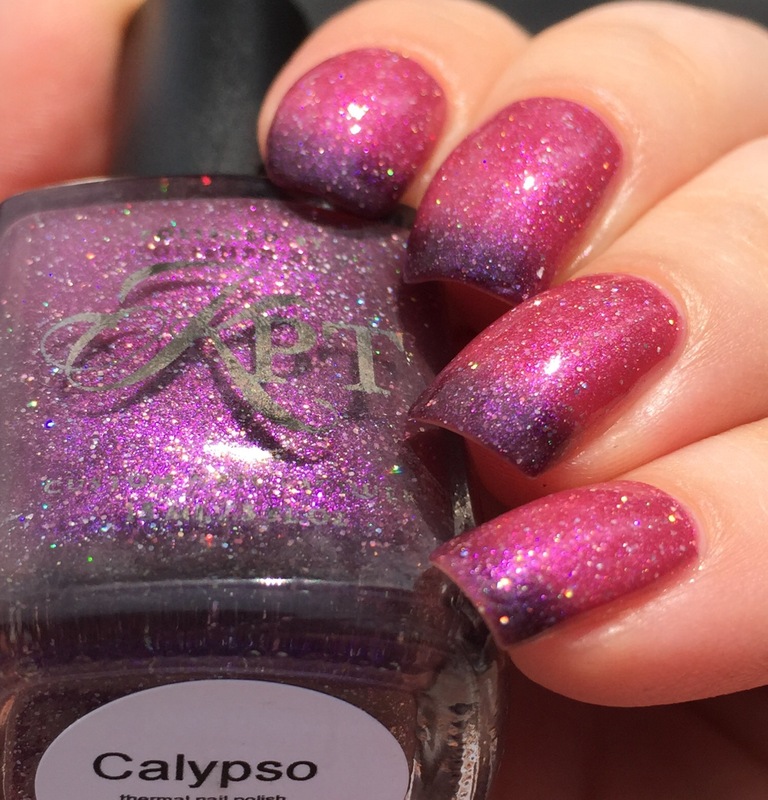 The 3rd Anniversary Trio came out a few months ago, but luckily Calypso is still available on Polished by KPT’s website. (If you’re interested in the rest of the trio, I reviewed the blue-green “Swimming with Mermaids” earlier this summer.) I realized that I have only ever purchased this brand during their pre-orders, so I can’t speak to the regular turnaround and shipping times. However, I can say that the packaging is top notch (I like the sleek, classy boxes), and everything is always packed with care. I love when thermals have two completely different shades! I skipped this one but really need to take another look at KPT’s latest offerings! I love thermals. I kick myself for not embracing them sooner. I still need to try this brand. GAH! So many brands and so little time! Beautiful thermal. I love that theres such an obvious color shift and it looks gorgeous in transition.